Not sure where to get your instrument calibrated? Please wait until you have a firm booking before sending equipment to WMT. If you require a calibration, please discuss your requirements with the relevant contact person who will assist in defining the scope of the work required and provide a written work order agreement that outlines the cost and time frame for the job. This must be signed and returned before any work can begin. WMT calibration test reports are issued under the 17025 ISO/IEC SRPS standard, while verification is done according with the national standards regulations. They are also clearly marked to show additional formal endorsement of their validity by other parties. Pressure standards provide a commercial calibration and/or verification service for a wide range of pressure measuring instruments. 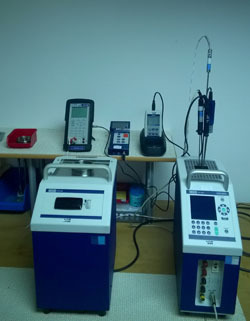 We calibrate instruments of different accuracies such as pressure gauges, transmitters and transducers in our calibration laboratory and at customer locations.